Amnesty International expresses its continued appreciation of the work of the Office of the UN High Commissioner for Human Rights (OHCHR) in Colombia to improve respect for human rights and international humanitarian law in the country. At its 19th session, the Human Rights Council (HRC) will have before it the High Commissioner’s report of the situation of the human rights in Colombia,  which regrettably is not available at the time of writing. This statement presents an overview of Amnesty International’s concerns in Colombia. The government of President Juan Manuel Santos continues to express a commitment to human rights and to end impunity. The government’s relationship with human rights organizations has generally been constructive, especially compared to the overtly hostile stance adopted by the previous administration. The government has also introduced some policies designed to benefit many, but not all, victims of the armed conflict. In particular, the Victims and Land Restitution Law, if implemented effectively, could be an important step in efforts to return some of the stolen millions of hectares of land to the rightful owners. Despite these positive developments, there have been few tangible improvements in the overall human rights situation. Civilians continue to bear the brunt of the human rights consequences of the armed conflict. Guerrilla groups, paramilitaries and the security forces continue to be responsible for crimes under international law, including unlawful killings, abductions or enforced disappearances, sexual violence and forced displacement. Those living in rural areas, particularly Indigenous Peoples and Afro-descendent and peasant farmer communities, are most at risk, as are those living in poverty in urban areas, human rights defenders and trade unionists. The Law acknowledges the existence of an armed conflict and the rights of victims. It provides for reparations for many survivors of human rights abuses, including those perpetrated by state agents. However, many other victims of the conflict will be excluded from making claims for reparation, while significant tracts of stolen land might still not be returned to their rightful owners. Amnesty International is concerned at the lack of safeguards to ensure that returnees are not forced to again cede control over their land to those who had forcibly displaced them or to others. Moreover, continuing threats and killings of those campaigning for land restitution and of those seeking to return to their lands risks undermining implementation of the law. : Some progress has been made in several key human rights investigations, including those linked to the “parapolitics” scandal, which exposed the illegal links between dozens of legislators and paramilitary groups. Some progress has also been made in connection with the DAS “dirty tricks” campaign, which revealed the links between the civilian intelligence service and paramilitaries aimed at discrediting, and in some cases threatening and killing, human rights defenders, judges, journalists, trade unionists and lawyers. However, most perpetrators so exposed continue to evade justice. This continues to send a powerful message to human rights abusers that they can continue to threaten and kill without fear of repercussions. Ongoing threats against and killings of some of those participating in human rights investigations, such as witnesses, survivors, victims’ families, human rights defenders, lawyers, prosecutors and judges highlight all too clearly how impunity in Colombia continues to be both a cause and a consequence of serious human rights abuses and violations. Progress has been particularly slow in criminal investigations into the “false positives” scandal, which has implicated members of the security forces in thousands of unlawful killings of civilians, and in the Justice and Peace process, in which only a handful of the thousands of paramilitaries who supposedly demobilized in the mid-2000 have been convicted of human rights violations. Recent successes by the courts in bringing several senior military officers to justice for human rights violations were tempered by strong public criticism of some of these convictions by President Santos and the Commander-in-Chief of the Armed Forces. Amnesty International is also concerned about efforts in Congress, supported by the government, to amend the Constitution to extend the military justice system’s role in investigating and prosecuting human rights violations implicating the security forces. Military courts in Colombia have a shameful history in closing such investigations without holding those responsible to account. If the amendment is approved by Congress it will represent a serious setback in efforts to combat impunity and run counter to international and Colombian jurisprudence. It also runs counter to the repeated human rights recommendations made by the United Nations and Inter-American Commission on Human Rights, which make clear that military courts must not investigate human rights violations allegedly committed by members of the security forces. Congress is also debating constitutional changes which could allow human rights abusers, including members of the security forces, to benefit from de facto amnesties. 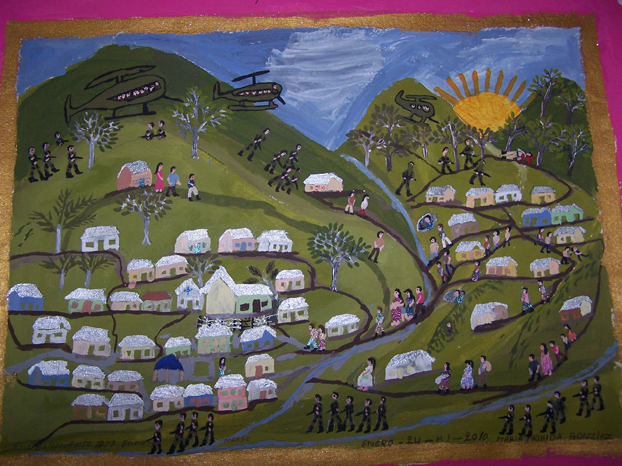 The Revolutionary Armed Forces of Colombia (FARC) and the National Liberation Army (ELN) continue to commit serious human rights abuses and violations of international humanitarian law, including unlawful killings, hostage-taking, forced displacement, recruitment of children, and use of indiscriminate weapons, such as anti-personnel mines, which have continued to kill and injure civilians. Although most kidnappings are attributed to criminal gangs, guerrilla groups continue to be responsible for most conflict-related cases. Despite their supposed demobilization, paramilitary groups, labelled “criminal gangs” (Bacrim) by the government, continue to expand and consolidate their presence across Colombia. They continue to commit serious human rights violations, sometimes with the collusion or acquiescence of the security forces, including killings and enforced disappearances, as well as “social cleansing” operations in poor urban neighbourhoods. Their victims continue to be mainly trade unionists, human rights defenders and community leaders, as well as representatives of Indigenous Peoples and Afro-descendent and peasant farmer communities. The work of human rights activists continues to be undermined by killings, threats, judicial persecution and the theft of sensitive case information. All parties to the conflict, but in particular paramilitary groups and the security forces, are responsible for human rights abuses against human rights defenders. Activists working on land restitution or representing displaced communities have been particularly at risk. Amnesty International believes it is very important that the National Protection Unit, set up last year, proves successful in ensuring that human rights defenders can safely pursue their legitimate work, and that measures specifically designed to protect land activists are implemented effectively. However, Amnesty international is becoming increasingly concerned about the manner in which some sectors in Colombia have sought to exploit recent claims about alleged false victims to undermine the work of human rights organizations and to call into question the veracity of some of the most horrific crimes committed by all the parties to the conflict. In October 2011, the Attorney General said she would investigate allegations that some victims of the Mapiripán massacre, in which dozens of people were killed and forcibly disappeared by paramilitaries in collusion with the army in July 1997, had not died and that the families of these alleged false victims had, with the help of human rights lawyers, claimed and received financial compensation from the state. The authorities, in blaming these human rights lawyers for the actions of these alleged false victims, and by calling into question the legitimacy of their work – and, by extension, that of other human rights NGOs – ignored the fact that the evidence of these “victims” was endorsed by the Office of the Attorney General, and not by the lawyers now blamed by the authorities. It is not the responsibility of NGOs to investigate the victims or any allegations levelled against them. If fraud is suspected, it is the judicial authorities that must investigate and bring those responsible to justice. Amnesty International is concerned that the questioning of the work of human rights defenders in the Mapiripán and in other cases is part of a campaign to discredit the work of certain NGOs that have tirelessly campaigned against impunity for members of the security forces implicated in human rights violations. The emergence of these alleged false victims also comes at a time when the military high command and some senior politicians, including former president Álvaro Uribe, are calling for the convictions against senior military officers implicated in serious human rights violations to be overturned. The government has made commitments to combat conflict-related sexual violence against women and girls, and has adopted some measures which it claims will help address the problem. However, sexual violence in the conflict continues to be widespread and systematic, and government compliance with Colombian Constitutional Court rulings on the issue, especially Judicial Decision 092 of 2008, remains extremely poor. In December 2011, a paramilitary was condemned by a court for sexual crimes, the first such conviction in the Justice and Peace process. Nevertheless, impunity for such crimes continues to be higher than for other types of human rights abuse, as highlighted in an Amnesty International’s 2011 report on conflict-related sexual violence in Colombia. Women human rights defenders and community leaders, especially those working on land issues, also continue to be threatened and killed. Women human rights groups, especially those working with displaced women and survivors of sexual violence, are also being threatened. to encourage the government of Colombia to pursue more vigorously the realization of its expressed commitment to human rights and to put an end to impunity. The HRC must be vigilant and denounce backsliding and the concerted efforts of powerful forces in Colombia to prevent progress and to undo progress already achieved. 2. See This is what we demand, justice!‘: Impunity for sexual violence against women in Colombia’s armed conflict, Amnesty International (AMR 23/018/2011).